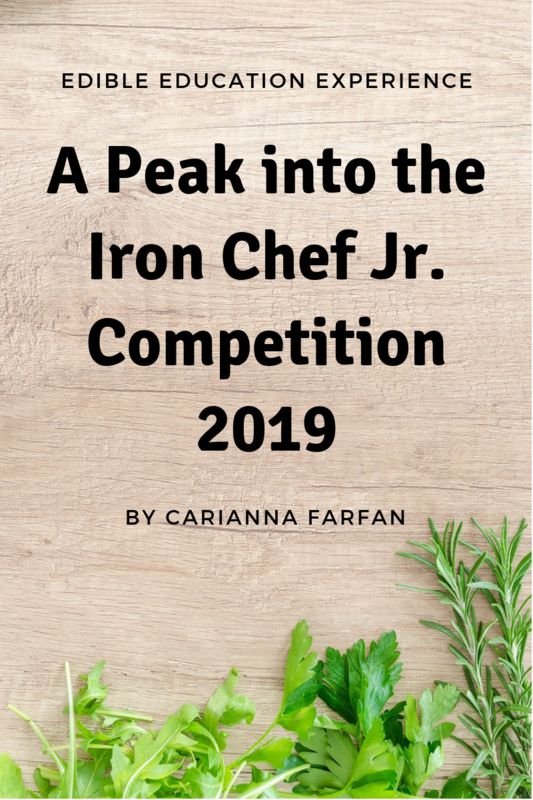 In the spring of each school year, a nervous excitement fills the Emeril Lagasse Kitchen House and Culinary Garden as middle schoolers from Orlando Junior Academy (OJA) prepare to compete in the annual Iron Chef Jr. Competition. Serious faces, polite handshakes, and apprehensive glances set the atmosphere, and with high intensity, the cooking begins! Orlando Junior Academy students spend many weeks practicing culinary skills that include proper knife usage, blending of spices and herbs, proper kneading and mixing techniques, and when to leave a pot covered while cooking. The integration of academics (such as history, writing, and science) provides unique learning opportunities. Students might share rations during a World War I trench cooking simulation, write a memoir of traditional home cooking, or grapple with the impact that healthy eating has on every body system. In a fun and engaging way, Edible Education Experience classes challenge OJA students to think deeper and make relevant connections. The weekly culinary explorations lend themselves to countless moments of self-assessment, criticism, compromise and, yes, even sacrifice. On Iron Chef Jr. Competition day, the aromas of fresh ingredients mix with the healthy hopes for our children’s future and permeates the minds of those judging, watching, and dreaming. To be sure, the decision of the guest judges will become tougher each year! To learn more about our hands-on gardening and cooking activities that make school relevant for kids, check out our programs and events pages. Author’s bio: Carianna Farfan is an educator with more than 15 years in the classroom. She is currently a middle school teacher at Orlando Junior Academy. In her spare time, she also serves on the Edible Education Experience Board of Directors.